This class will focus on Door Handles, using traditional forged iron door handle designs as a starting point. The styles of historic door handles found in the US vary by region, due in most part to the country of origin of each region's inhabitants. In this class we will look at a number of door handle designs found in the Northeast US, showing Dutch, German, French and English influences. Starting with a simple Dutch style handle, we will then move on to several designs found in and around the Hudson Valley of NY showing these varied influences. We will also cover the inner groupings (latch bar, staple and keeper) for these handle styles. Some of the skills we will refine are: shouldering, preshaping and spreading forms, punching, drifting, hammer welding, nail making. 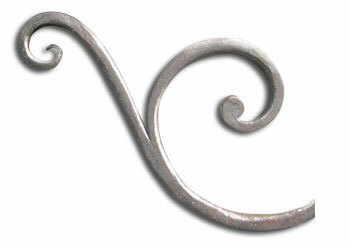 We will also discuss the considerations when working with "wrought iron," as compared to steel. Students are invited to bring any door handles they have found, new or old, for discussion. This class is best for people with some forging experience who can find their way around the anvil and forge. Making Tongs - Get a Grip! Tongs, the most basic of tools, are used to hold your work while forging. Why buy tongs when, with a little practice, you can make your own. In this class we will make four basic types of tongs, starting with "flat jaw" tongs, the basic design for holding flat, square and round stock. With what is learned making the "flat jaw" tongs we can then move onto making "box" tongs for holding rectangular stock. From there we progress to "Poz" tongs, one of the most useful tongs to have at the forge. And lastly we will make a pair of "bolt eye" tongs for holding larger square and round stock. The skills we will work on while making tongs include: shouldering, hammer welding, punching, riveting, as well as hand and power hammer forging. This class is recommended for beginners with some forging experience to intermediate smiths.